Moscow is the most expensive place to live in July 2012 based on the cost of living excluding the housing, education, healthcare and transport baskets. Many companies cover these costs on behalf of the employee while on international assignments. The most expensive place to live based on the overall cost of living, encompassing all cost of living baskets is Hong Kong. The latest international cost of living rankings are based on data collected for 780 international locations, covering every country world-wide. In many international assignments, basket groups such as housing, education, healthcare and transport are provided for by the employer, either in kind or in the form of an allowance over and above the salary. The reason why we would exclude these items, is to calculate the cost of living difference only for those items an expatriate would be responsible for paying for. If we take these basket items out of the cost of living calculation, the cost of living indexes change accordingly. For an expatriate, where these benefits are provided for them, Moscow is the most expensive city to live based on what they would typically spend their salary on. The countries that dominate the rankings are mostly due to their strong currencies which have made them relatively more expensive. Local inflation is far less of an influence on cost of living compared to changes in exchange rates. The impact of a strong currency is that imports become cheaper. 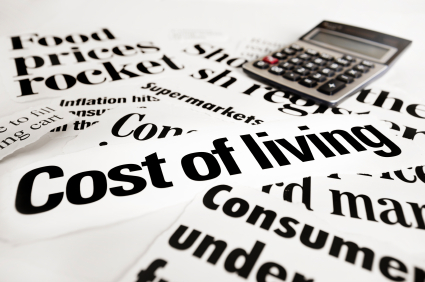 For locally employed people, especially when purchasing imported goods and services, the cost of living may not seem to have a major negative impact. In fact overseas holidays become relatively cheap. However, it also means that they are relatively more expensive for those paying with foreign currency which impacts exports and the overall cost to an employer sending an assignee to work in these countries. In addition to the impact of strong currencies, much of the developed world has historically embedded high cost of living structures that keep them amongst the most expensive places to live. Europe and America have 21 locations in the top 50 based on the overall cost of living index and 31 out of 50 places based on the cost of living excluding housing, education, healthcare and transport. The major factor contributing to this is the relatively higher level of pay in the developed world, particularly amongst lower level jobs. By contrast Africa, Asia-Pacific, the Middle East and South Asia have 29 places in the top 50 based on the overall cost of living index but only 19 out of 50 places based on the cost of living excluding housing, education, healthcare and transport. To provide an assignee, sent to any of the most expensive countries, with a similar purchasing power to what they have in their home country, requires an adjustment to their assignment salary. The amount of adjustment depends on which country they come from. The larger the difference in cost of living, the larger the adjustment required to ensure a similar level of purchasing power in the host country. expatriate assignments online, using Xpatulator.com’s 3 premium content calculators. This entry was posted in cost of living rankings and tagged cost of living rankings, current cost of living, International Cost of Living, recent cost of living rankings. Bookmark the permalink.